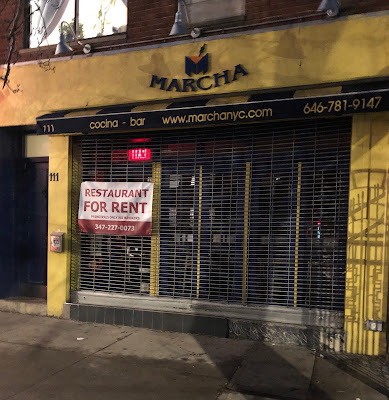 After three-plus years on Avenue C at Seventh Street, Marcha Cocina has closed. Dave on 7th shared this photo, showing the gate down with a for-rent sign attached. This tapas joint was an offshoot of the Marcha Cocina in Washington Heights. That location never reopened after a fire this past September. This space at 111 Avenue C was previously Cafe Cambodge (opened February 2014), which happened after the owners revamped the space from its 6-year run as Arcane. I am not surprised about this. I live across the street. This wasn't a sought after mainstay. Also, the clientele were a little strange and it was usually empty most of the time. This spot is doomed. I remember it's previous tenant before the French restaurant, where one of the owners tragically died from her balcony in the back of the building. Maybe this could be a cafe?? A lot of closed and failed space on Ave C very risky proposition even longtime successful business's are experiencing a downturn in customers. Recently reopened EVT looks like the next casualty on the Ave. Hard to say what could work the "cocktail set" already has a few watering holes to choose from. Relatively new arrivals Wayland and ABC Beers seem to have a formula that works.